To purchase an individual copy of this issue, follow the link below. Use the reference V37I12 and a PDF will be emailed to you. 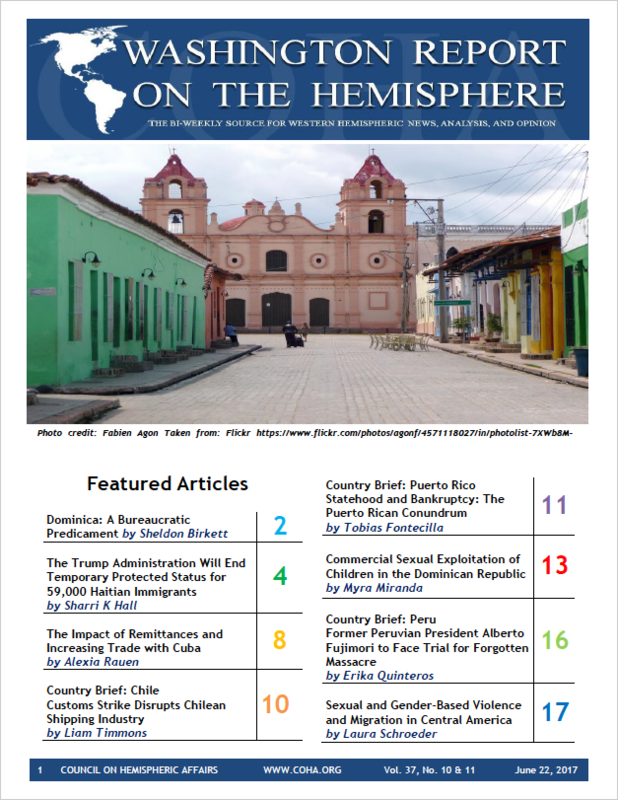 If you wish to purchase a print copy, please email coha@coha.org with your shipping details and the reference V37I12. 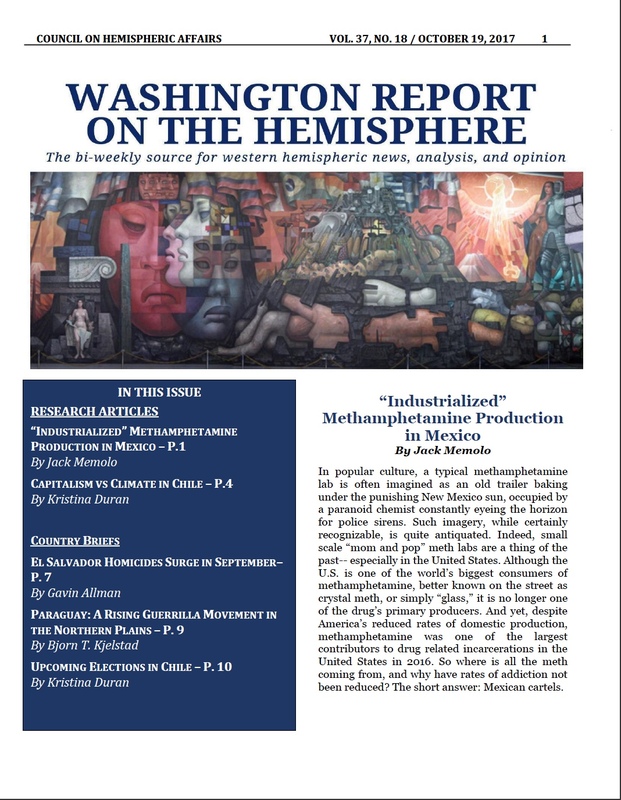 On May 11 2012, the United States’ Drug Enforcement Agency and local Honduran forces were involved in a clash off the coast that left four dead, including two pregnant women and a fourteen year old. 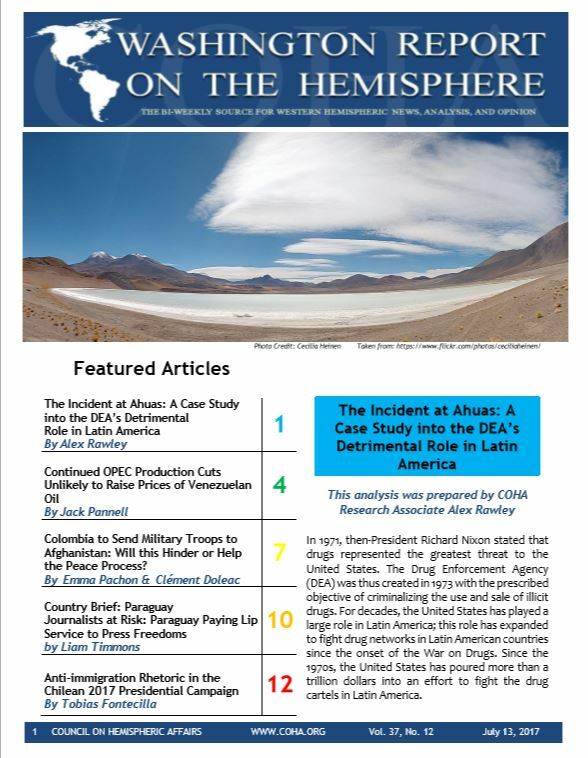 Research Associate Alex Rawley looks at this incident and examines the necessity for reform of the DEA’s policy towards Latin America. Research Associate Jack Pannell argues that OPEC has lost its power as a cartel. With the expansion of U.S. shale oil, traditional oil producing nations have been hit by low worldwide oil prices. Shale has proved resilient to all OPEC’s tactics to raise oil prices so far. No country has been hit by these prices harder than Venezuela. And Pannell argues that with prices unlikely to return to pre-2013 levels, a solution to the economic crisis in Venezuela is unlikely in the short term. Research Associate Emma Pachon and Senior Research Fellow Clément Doleac report on Colombian President Juan Manuel Santos’ expected proposal to deploy Colombian Special Forces and tactical instructors to Afghanistan. This action could project the image of a strong post-peace arrangement Colombia, and resume Colombia’s involvement in peacekeeping responsibilities dating back to the Korean War. However, this raises the issue of whether Colombia can safely project its military might abroad while maintaining domestic peace. Research Associate Liam Timmons discusses violence against journalists in Paraguay, and the efforts taken by the Paraguayan government to protect them. Historically, Paraguay has been a hostile environment for journalists, who are often threatened, injured, or even killed in reporting on the drug trade or corruption. Although nominal actions have been taken, there is still a long way to go before Paraguayan journalists can practice their trade freely. Research Associate Tobias Fontecilla writes about the rise of far-right political parties and their associated anti-immigrant rhetoric in Chile. Immigrants have been blamed for adding to poverty, crime, and unemployment because of Chile’s recent economic slowdown, although these assertions are baseless. These claims have the ability to affect Chile’s presidential elections, possibly by propelling far-right parties to victory on their backs.